#NASA in Bomet : Kenya political dynamics changing, NASA and Jubilee strongholds interchange. - Bana Kenya News, Real African Network Tubanane. Home featured News #NASA in Bomet : Kenya political dynamics changing, NASA and Jubilee strongholds interchange. #NASA in Bomet : Kenya political dynamics changing, NASA and Jubilee strongholds interchange. This is a third time after the NASA Brigade welcomed by supporters flooding the arena. The Bomet rally was one of its own where thousands of people flooded to welcome Governor Isaac Ruto after the NASA manifesto. The first time people flooded in a rally was in Mombasa where the ODM soldiers led by the Mombasa governor Ali Hassan Joho encroached the Tononoka grounds and left people talking about it. On the NASA flagbearer naming day, hundred of thousands of Nairobi people flock to see and witness the NASA presidential candidate. Bomet declaration was on pick after the Governor Isaac Ruto led the NASA team in his county for Presidential bid launch. The last mammoth witnessed yesterday at Bomet County shows that people are tired of the corrupt and inequality government. 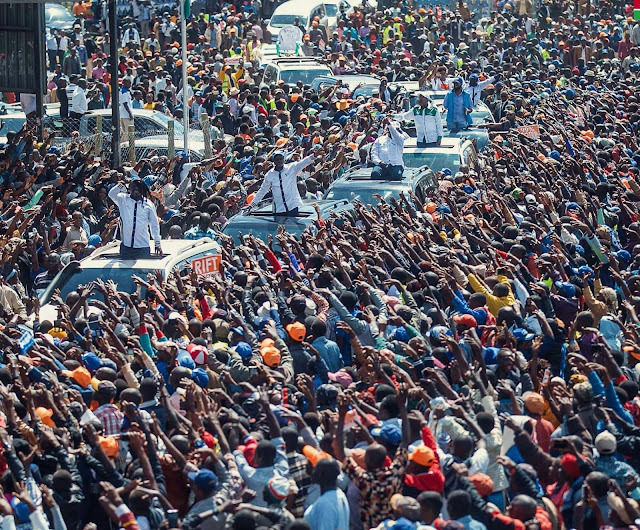 The sea of humanity in Bomet NASA rally paralyzed William Ruto’s mouth and sent Uhuru permanently into the intestines of panic as claimed by his closest allies, the president’s heart was beating like the beating Satan will receive on Judgment day from God and his army which will include Onyango Ochieng Jr. It was packed, that breathing became a problem.